In retrospect, his tone was far too casual. "We have a...dilemma...in the kitchen," Noah said delicately, peeking his head into the bedroom, where I was already snuggled in bed with a book while the storm blew outside the bay window. "Oh?" I said, glancing up. Enjoying a good guessing game, I ran through a number of possibilities, none more serious than, Should we bother resetting the microwave clock or wait until the storm is over? "Yeah, uh, I opened the door to let Zoe in, and she brought in...a critter." "A...critter?" My voice nearly a whisper, the room suddenly spinning as PTSD set in. "A critter that's...still alive," he admitted reluctantly. He ignored my question. "A critter that is...a mouse..."
Several minutes later, after Noah had revived me with a winning combination of smelling salts and an Epi Pen, he coaxed me into the kitchen, where he had supposedly contained the mouse with a blockade of throw pillows. I climbed across the kitchen table and chairs, then perched myself on the counter next to the fridge. "You've already tried to catch it, haven't you?" I asked as I pointed the flashlight in the general direction of Behind the Fridge. "Yes," he said in ashamed defeat. "That's what the Tupperware and mixing bowl on the floor were for, wasn't it?" He didn't answer, but cast his eyes downward and got to work. I knew it was true; Noah's solution to most household problems is Trap It Under A Bowl. As he began to shimmy out the fridge, I silently reassured myself that it was just a mouse. 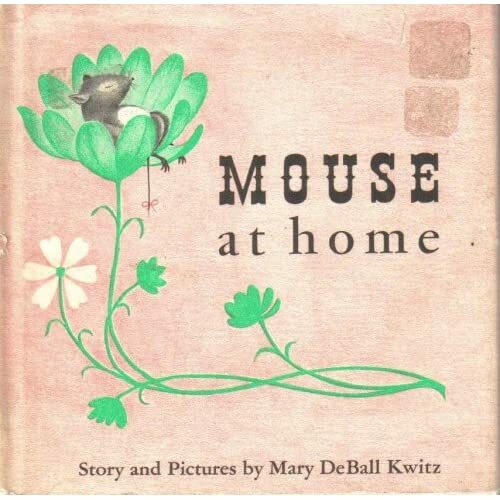 Mouse at Home, one of my favorite children's books, was an obvious resource for consideration. Unfortunately the book focused most prominently on lessons of friendship, industriousness and good citizenship—mouse etiquette and culture, if you will—rather than the basics of mouse behavior. As far as I could tell, the mouse in our kitchen wasn't wearing an apron and baking acorn cakes to share. Just as I was wondering if mice can climb, a glass vase full of decorative rocks tumbled right off the top of the fridge and smashed on the floor at Noah's feet. "Okay, I'm going to need you to carry me back to bed now," I told him. "I've done all I can do here." I snuggled back into bed ensconced between Cody and Bonnie, confident that the dogs would alert me if any small rodents came into the room. Forty minutes later, after a lot of muffled thuds and some clinking of glass shards, Noah returned to the bedroom. "I have some news," he said somberly. "And...?" I asked. I hoped he was able to trap and release the poor creature instead of killing it. "And..." he sighed, then gathered up his resolve, "And...I'm pretty sure the mouse is not hiding inside the fridge." "THAT'S the news? That you're pretty sure that the mouse isn't inside the fridge? Where IS the mouse?" "Well, I left the back door open, so I'm hoping that while the room was clear the mouse made a run for it." His earnestness would have been endearing if the subject matter involved less vermin. All I could do was stare, slack-jawed. "Also," he added, "I didn't feed Zoe tonight, and I told her that if the mouse is still inside, it's her job to destroy it." With that most reassuring plan of action, I overdosed on Benadryl and slumbered peacefully. As of today, neither droppings nor a carcass have been found ("Cats don't usually eat the head or tail," Mom helpfully informed me). But if I come across that mouse in the house, there will be droppings and a carcass for Noah to clean up: Mine. This is the same son who wouldn't let me step on a worm on the sidewalk after a storm. I know it's not a funny situation, but I'm giggling uncontrollably at this. In my household, the biggest problem is what I call the Creature That Shall Not Be Named. Let's just say that it's very, very small, has more appendages than I want to think about, and manages to strike paralyzing fear into my heart. Just thinking about this makes me want to take a Valium. you would not like working at my airport then...i took a picture of a mouse last month by the elevator because no one believed me when i said i saw them.